Where: Cracovia Club, 375 Marshall Rd, Beechboro. Online ticket sales have now ceased, but you can still get tickets at the door! 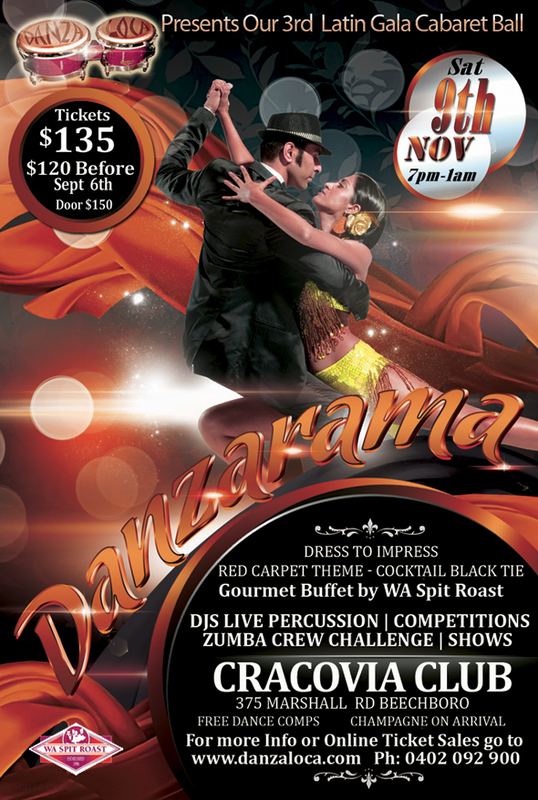 DANZA RAMA is back November 9th!! Our 3rd annual Gala Latin Cabaret Ball will be our best yet, combining awesome atmosphere with professional and amateur entertainment and activities for both our social dancing/Salsa crowd and our awesome Zumba fitness crew! This year’s programme is shaping up even better, as each year we learn more about producing the type of event that Danza Loca students will continue to enjoy and demand! Danza Rama is our biggest PARTY of the year, but it’s still a cabaret, with professional and amateur dance performances and some friendly competitions included, though we’ve kept the programme simple to maximise dancing and party time with our DJ’s and percussion crew. We’ll be dining from a sensational gourmet buffet and carvery from sponsors, WA Spit Roast. Ticket price still includes Champagne on arrival and some table wines. HOW CAN YOU BE PART OF DANZA RAMA? BUY A TICKET! Online ticket sales have now ceased, but you can still get a ticket the door! Bring your friends and join the party! 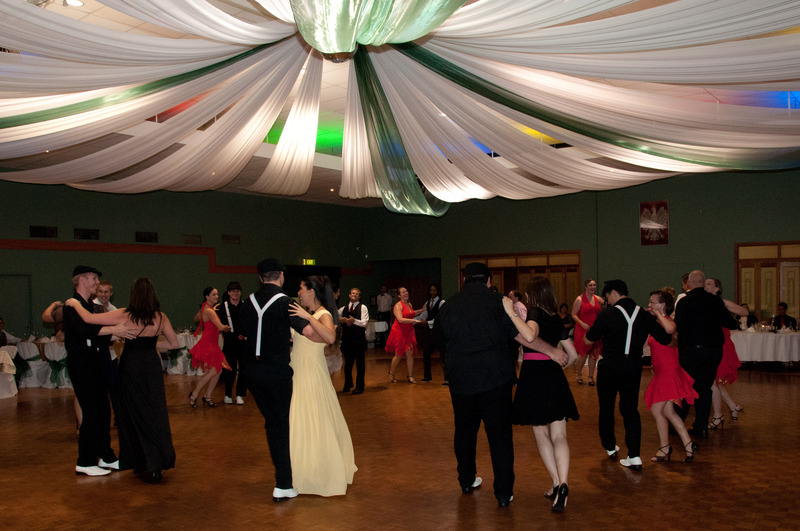 Anyone can enter our friendly social dance competitions on the night, and even be a part of the show! It’s not too late to join one of our student performance teams or even allow us to choreograph your own individual “spotlight” presentation with your own teacher! Contact Principal, Simon Fryda for details regarding performance opportunities available. Buy early to avoid disappointment and save money! Tickets may also be purchased (cash only), at our Zumba and Salsa classes. Monies collected from classes will be receipted and your tickets emailed to you from head office for you to print. Tickets may be “Snail” mailed for those with no internet access if requested. The competition structure this year focuses on maximum fun for social dancers. Only 7 friendly competitions are planned for Danza Rama. If you wish to participate in any of the competitions at Danza Rama you must REGISTER ON THE NIGHT (simple entry forms will be available on tables, to be completed and submitted to the Registrar. Male competitors will need to collect a number which must be worn while competing). There are NO FEES for entering the competitions. Adjudicators will be judging partnering skills, timing and Latin style. 1) Salsa Casino (Restricted): Up to Intermediate 2 level figures only. Jack and Jill (Juan y Juana) Events: Partnerships are randomly drawn from all entrants. No “Pros”. No restrictions on steps other than mentioned in rules below. 7) Rueda Triples (teams of 3 couples each, calling their own Ruedas!). Pros ok! Such individuals are considered to have an unfair advantage over regular dance students in regards to resources available for competition preparation. WIN 3 MONTHS of FREE ZUMBA® or BOKWA FITNESS CLASSES for YOU and YOUR CREW!!! 2 minute DANCE (not “Fitness”) performance, vying for the main prize of 3 months FREE ZUMBA®! • Each crew will perform separately to their choice of music. • Music must be edited so as to not exceed 2.00 minutes. • All crew members must be in motion for 80% of the routine. the second team to register must find an alternative. Register your entry by 5pm Friday , November 2nd so we can include you in the programme. Teams need to register your team name, all members and provide a pre-recorded version of your intended music.